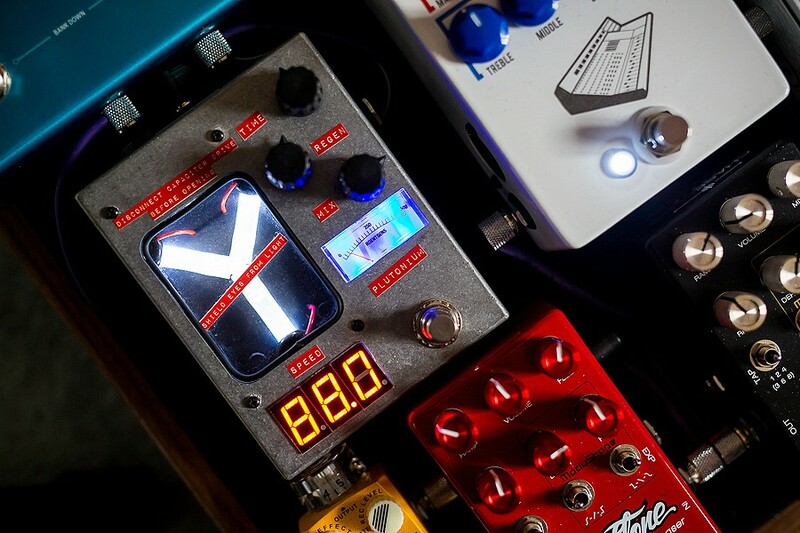 Here’s the ordering page for the latest run of the Flux Capacitor pedal. The new pedal retains all the aesthetics of the previous pedal, but at it’s heart is a newer chip. This enables delay times of up to 900ms. The pedal still has the lovely warm analog sound, with increasing amounts of high frequency roll-off for the delayed portion as the time is increased – just like an old tape delay. The clean signal is hardware-mixed and remains analogue throughout. The latest run of pedals feature extra modes via a mode switch for versatility. Simply flick the switch to transform the pedal into a great sounding reverb, or excellent ambient shimmer reverb. Roentgen meter needle reacts to your picking intensity and the MPH meter is set to the all-important 88.0mph – perfect for getting you back to 1955! I’ll be as honest as possible now. I don’t want people thinking 4114 Effects is some massive company that churns out pedals by the bucket load. I’m just one guy who builds pedals in a small workshop in his house.I’m always overwhelmed and humbled by how many enquiries I get to build these. I’m make these pedals one-by-one – assembling PCBs from scratch and cutting / drilling / wiring everything by hand. The enclosures are professionally laser-cut for accuracy to speed up the process, everything else is hand made. I have been a little optimistic with previous build time estimates, so I’m going to give a more realistic 2-3 month estimate . If you’re OK with this then please click the button below. What I will say is that I always work as many hours as possible over the coming weeks to get the pedals out as quickly as I can. I usually personalise my pedals with the owners name. If you’d like this option, there is a message field at checkout – please enter the name you would like on the pedal. Please note that this ordering link is for the standard delay pedal, with glowing capacitor, active VU meter and speed set to 88.0mph. If you have any special requirements – different circuit inside, ideas for options etc. please email me to discuss before ordering. Thanks! Please take note of the two options in the drop down menu when buying the pedal. If you live outside the UK you must use the international orders option to cover the additional shipping and insurance costs. For my friends / potential customers in the USA / Australia / Canada etc. – I am aware there will be duty to pay when you receive the pedal. I am informed that for the USA it should be around 4.7% plus a small handling fee. I will fill out all the relevant forms over here to help speed the pedal through customs, but any import duty that’s payable is solely the customers responsibility. All pedals will be sent fully tracked and usually require a signature on delivery. I will keep a database of who ordered and when, so the pedals will be assembled in a first come, first served basis.